New Delhi: On expected lines, UPA candidate and former finance minister Pranab Mukherjee on Sunday won the race to occupy the Rashtrapati Bhavan. Mukherjee secured 7,13,763 vote value in Presidential Election 2012, well ahead of the half-way mark of 5,25,140 in an electoral college of over 10.5 lakh. His rival PA Sangma, supported by some opposition parties including BJP, could manage get only 3,15,987 vote value, according to Rajya Sabha Secretary General VK Agnihotri. Out of the total 748 MPs, Pranab got the support of 527 while his rival, PA Sangma polled 206 votes in his favour. A total of 15 votes were declared invalid. Fifteen votes including that of SP chief Mulayam Singh Yadav were invalid. Of these, nine were to be in favour of Mukherjee while six for Sangma. Each MP has a vote value of 708. There are a total of 776 voters in both the Houses of Parliament. The Electoral College also consists of 4,120 MLAs in the states. Among the states, there was apparent cross-voting in Karnataka where BJP runs a government. Mukherjee got the majority votes in the 224-member Assembly with 117 MLAs voting for him. Sangma could get only 103 votes while three votes were invalid. One MLA did not vote. The value of votes polled by Mukherjee was 15327 while it was 13493 for Sangma. In Andhra Pradesh which has a 294-member Assembly, Mukherjee got the support of 182 MLAs including that of Congress and YSR Congress, while Sangma got the backing of three. Five were invalid. In terms of vote value, Mukherjee got 26,936 while Sangma got 444. A total of 190 MLAs voted because TDP and TRS abstained. Each MLA in Andhra Pradesh has a vote value of 148. In the 126-member Assam Assembly, Mukherjee got 110 votes while Sangma got 13. Two votes were invalid while one did not vote. In terms of vote value, Mukherjee got 12,760 while Sangma got 1,508. In Bihar too, where the ruling JD(U) has declared support for Mukherjee, the UPA candidate got 146 out of the 240 votes polled in the 243 member Assembly. Sangma got 90, mostly from BJP, which shares power with JD(U). Mukherjee's vote value in the state was 25,258 while for Sangma it was 15,570. Three votes were invalid while one did not vote. In 90-member Haryana Assembly, Mukherjee got 53 votes while Sangma received 29. Eight were invalid. In terms of vote value, Mukherjee got 5,936 and Sangma got 3,248. Mukherjee got 59 votes and Sangma 123 votes in 182-member Gujarat Assembly where BJP has the majority. In terms of vote value, Mukherjee got 8,673 while Sangma got 18,081. In BJP-ruled states of Chhattisgarh and Goa, Sangma got majority of votes. In the 90-member Chhattisgarh Assembly, 39 votes went to Mukherjee while Sangma got 50. One vote was invalid. In terms of vote value, Mukherjee got 5,031 while Sangma got 6,450. Mukherjee got 9 votes and Sangma 31 in 40-member Goa Assembly. In terms of vote value, Mukherjee got 180 while Sangma got 620. Mukherjee led Jammu and Kashmir and surprisingly in Jharkhand where BJP shares power with JMM. In BJP-ruled Himachal Pradesh Mukherjee trailed as expected. In 68-member Himachal Pradesh Assembly, Mukherjee got 23 votes while Sangma won 44 votes. One vote was invalid. Mukherjee's vote value was 1173 while it was 2244 for Sangma. Jammu and Kashmir gave Mukherjee 68 votes while Sangma got 15 votes. Two votes were declared invalid. Mukherjee's vote value here stands at 4896 while Sangma got 1080. The Assembly has 87 MLAs. In 81-member Jharkhand Assembly, Mukherjee got 60 votes while Sangma won 20. Mukherjee's vote value is 10560 while Sangma's stands at 3520. In Kerala, it was a clean sweep for Pranab Mukherjee. He won all the 124 votes polled while one was invalid. Sangma drew a blank. CPI and RSP members abstained from voting which has a 140 member Assembly. Vote value for Mukherjee in Kerala stood at 18848. In 230-member Madhya Pradesh Assembly, Mukherjee got 73 votes while Sangma got 156. Four votes were invalid. In terms of the vote share, Mukherjee got 9563 and Sangma 20,436. In Maharashtra, Mukherjee polled 225 votes which have a value of 39375, while Sangma got 47 votes with a value of 8225. Two votes were invalid. Mukherjee got the support of BJP ally Shiv Sena in the state. Manipur gave 58 votes to Mukherjee with a value of 1044. Sangma got only one vote with a value of 18. One vote was invalid. Sangma's home state of Meghalaya won him 23 votes with a value of 391, while Mukherjee polled 34 votes with a value of 578. Two votes were declared invalid. In Mizoram, Mukherjee got 32 votes with a value of 256 while Sangma polled 7 votes with a vallue of 56. One vote was declared invalid. Mukherjee got overwhelming support in Nagaland of 58 legislators with a vote value of 522, while Sangma drew a blank. Two votes were invalid. Odisha, where Chief Minister Naveen Patnaik had announced support to Sangma, voted in favour of the Sangma giving him 115 votes with a value of 17,135. Mukherjee got 26 votes with a value of 3874. Punjab gave 70 votes to Sangma with a value of 8120 while Mukherjee got 44 votes with a value of 5104. Two votes were invalid. Rajasthan gave 113 votes to Mukherjee with a value of 14,577, while Sangma got 85 votes with a value of 10965. In Sikkim, Mukherjee got 28 votes with a value of 196 while Sangma polled one vote with a value of seven. Two votes were invalid. Tamil Nadu, whose ruling AIADMK backed Sangma's candidature gave him 148 votes with a value of 26,048. Mukherjee polled 45 votes with a value of 7920. Four votes were invalid. Mukherjee swept Tripura polling 56 votes with a value of 1426 while Sangma managed one vote with a value of 26 votes. West Bengal, Mukherjee's home state voted overwhelmingly in his favour giving him 275 of the 294 votes with a value of 41525. CPI and RSP had abstained from voting. Sangma polled three votes with a value of 453. Four votes were invalid. In Uttarakhand, Mukherjee polled 39 votes with a value of 2496, while Sangma got 30 with a value of 1920. Uttar Pradesh also voted overwhelmingly for Mukherjee giving him 351 votes with a value of 73,008 while Sangma polled 46 votes with a value of 9568. Mukherjee got 42 votes in Delhi with a value of 2436 while Sangma got 23 with a value of 1334. Puducherry gave 23 votes to Mukherjee with a value of 368 while Sangma got five votes with a value of 80. Pranab will now become the 13th President of the country. The polling percentage was less than expected this time with only 72 per cent of the total votes - valued at 11 lakh - polled. 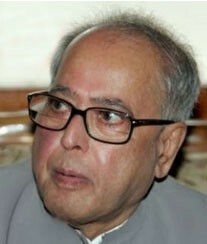 Pranab will be administered the oath of office by the Chief Justice of India on July 25 at 11.30 am.